With its exquisite coconut fragrance and taste, shredded coconut and coconut milk add a sophisticated accent to this gorgeous festive showpiece. This cheesecake gives triple-dose of the coconut--shredded coconut in the crust, coconut milk in cheese filling and then toasted coconut sprinkled on top. This is an excellent cheesecake if you are looking for indulging dessert for a dinner party. So Delicious! RecipeSavants.com With its exquisite coconut fragrance and taste, shredded coconut and coconut milk add a sophisticated accent to this gorgeous festive showpiece. 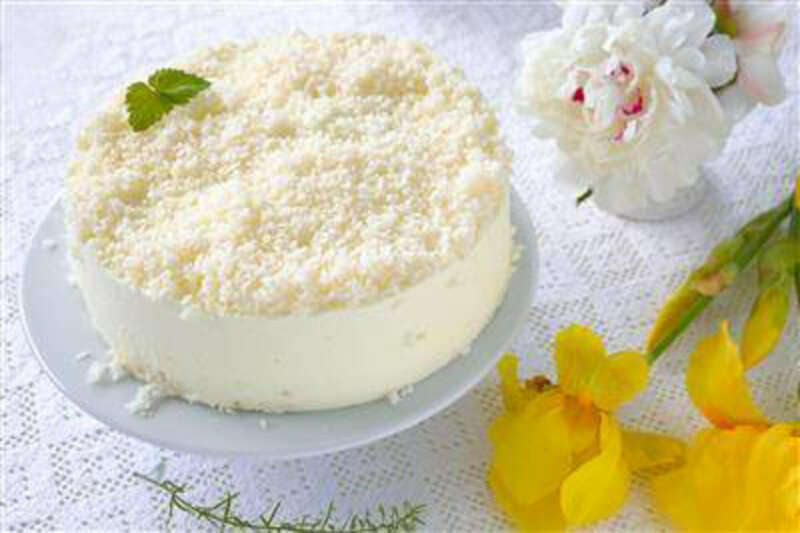 This cheesecake gives triple-dose of the coconut--shredded coconut in the crust, coconut milk in cheese filling and then toasted coconut sprinkled on top. This is an excellent cheesecake if you are looking for indulging dessert for a dinner party. So Delicious! Smart Recipes, American Recipes, Eggs Recipes, Recipes Eggs American Coconut Cheesecake PT1H55M Serves 8 Ingredients: 1 Cup Graham Cracker Crumbs 5 Tablespoons Sugar 0.5 Cup Sweetened Coconut 5 Tablespoons Butter 1 Pound Cream Cheese 1 Cup Sugar 1 Tablespoon Cornstarch 1 Tablespoon Vanilla Extract 0.25 Tablespoon Salt 3 Large Eggs 7 Ounces Coconut Milk 0.5 Teaspoon Coconut Extract 3 Tablespoons Shredded Coconut Preheat the oven to 350 degrees. Line a springform pan with parchment paper. For crust: In a bowl, add graham cracker crumbs, shredded coconut, granulated sugar and mix well. Add melted butter and mix until well combined. Place the graham cracker mixture into the prepared springform pan and with your hands, press firmly to fit into the bottom and up the sides of the pan. Bake for about 12 minutes or until light golden brown. Remove from oven and keep aside to cool. Now, set the oven to 325 degrees. Arrange a rack in the center of oven. For filling: In the bowl of a stand mixer with the paddle attachment, add cream cheese and beat until smooth. Add cornstarch, sugar, vanilla bean paste and salt and beat until creamy. Slowly, add beaten eggs, mixing well between each addition. Add coconut milk and coconut extract and beat until well combined. Place filling mixture over cooled crust evenly. Arrange the springform pan into a large roasting pan. Add hot water into the roasting pan until it reaches about halfway up the sides of the springform pan. Bake for about 65-75 minutes or until the filling is set. Remove the roasting pan from the oven. Carefully remove the springform pan from roasting pan and place onto a wire rack to cool completely. After cooling, refrigerate the pan for about 8 hours. Carefully, remove cheesecake from the springform pan. Serve with the sprinkling of toasted coconut.